How’s everyone out there doing today? I hope you took full advantage of the weekend and enjoyed it as much as you possibly could. I stayed busy most of the weekend, so it seemed like the weekend just flew by for me. What did you do this weekend? Leave a comment below and let me know. I’m happy to say that thanks to all of you we had an optical illusion actually go viral last week. The illusion was a brain teaser and there was a lot of debate over it. The illusion I’m talking about is the “Count the Balls Optical Illusion,” which I highly suggest you check out if you haven’t done so already. Today, I have another optical illusion that I’m going to go ahead and post up for all of you. This one could be considered a brain teaser optical illusion, as well. 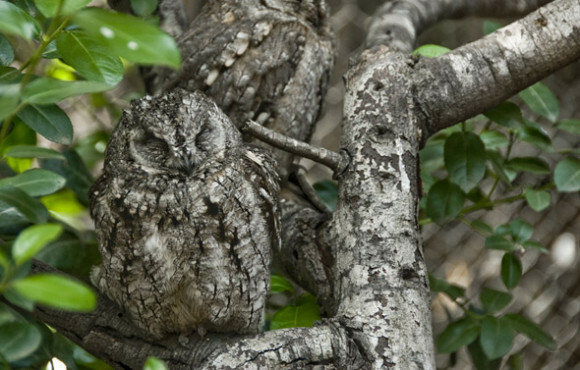 First of all, there’s a hidden owl in the image that you have to spot, which shouldn’t be too hard. Now, your job is to tell me whether or not you think the owl is real. Is the owl part of the actual tree itself? Is the owl a creation of Photoshop? Maybe the owl is real and hasn’t been manipulated in any way? Leave your comment below and tell me what you think. Do you want to see another really cool optical illusion that’s going to put your brain to the test? Have a look at this Colorful Text Optical Illusion. There are two owls in the photo.The one in front, and the other on the branch behind. Both are real owls. Or, you could decide if BOTH are real or not. There are two real owls on that tree, their natural camoflage matches the tree prefectly. Actually there are two owls in the tree. It’s real. I recently saw some special on tv that looked like this photo. By the way James, so what’s the answer? 15 balls it is! A bit obvious. Actually I believe there may be a second owl behind the first. Wonderful natural camo! I think it’s real. it’s camouflaging.